Stay tuned for upcoming events for The Forgotten Empress in near future. 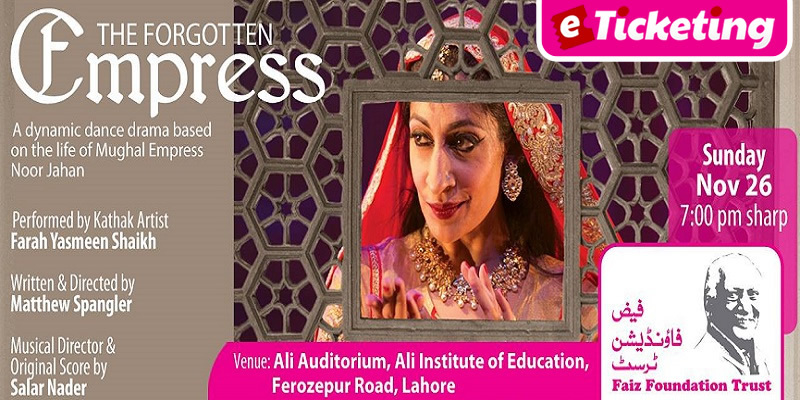 The Forgotten Empress, a Drama on Mughal Empress Noor Jahan will be presented on 26th November 2017 at Ali Institute of Education in Lahore. It is being organized by Faiz Foundation Trust. It is choreographed, conceived and performed by acclaimed Kathak artist Farah Yasmeen Shaikh. Matthew Spangler is the Writer and Director while Salar Nader is Musical Director. Come and watch this art masterpiece which is a spectacular combination of drama, dance and music. The Forgotten Empress is dynamic dance drama based on the history and life of Empress Noor Jahan. It explores her strength and influence in the 16th century Mughal India. It overlooks how she maintained her delicate power in a male dominated empire, only to be almost forgotten in the latter years of her life and in death. It is an enthralling performance of South Asian classical dance, live music, multimedia, and theater. It delivers the spectrum of emotions, relationships and occurrences surrounding this powerful woman. Best Viewed at 1024 x 768 pixels and above. This Page loaded in 0.09232 seconds on Tue, Apr 23, 2019 (21:20).